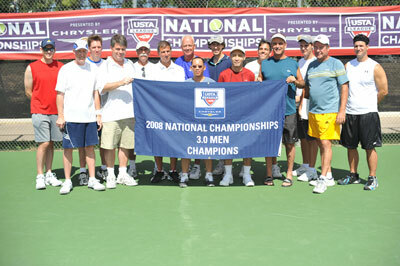 TUCSON, AZ - OCTOBER 5, 2008 - The men’s team from Columbia, Maryland representing the USTA Mid-Atlantic Section, captured the national title at the USTA League presented by Chrysler 3.0 Adult National Championships held at the Randolph Tennis Center in Tucson, Arizona. The Columbia team defeated a team from Indianapolis, Ind., 5-0 in the Championship match. Earlier in the day, the Columbia team defeated a team from Lancaster, Penn., 4-1 in the semifinals. They advanced this far by winning their round-robin flight contested Friday and Saturday. The team is co-captained by James Dorf and Jon Smith and features Tom Dreisch, Abraham Amoyal, Renaldo Savady, Thuy Than, Robert Stahler, Andrew Cuthill, Glenn Zenker, Tom Baldino, Damon Humphreys, Daniel Martin, Richard Briggs, David Arbanel, and Scott Felton. The top four teams in order of finish are: Mid-Atlantic (Columbia, Md. ), Midwest (Indianapolis, Ind. ), Middle States (Lancaster, Penn.) and Southern (Baton Rouge, La.). This year’s USTA League presented by Chrysler 3.0 Adult National Championship has drawn the top 34 teams (17 men’s and 17 women’s) from throughout the nation.